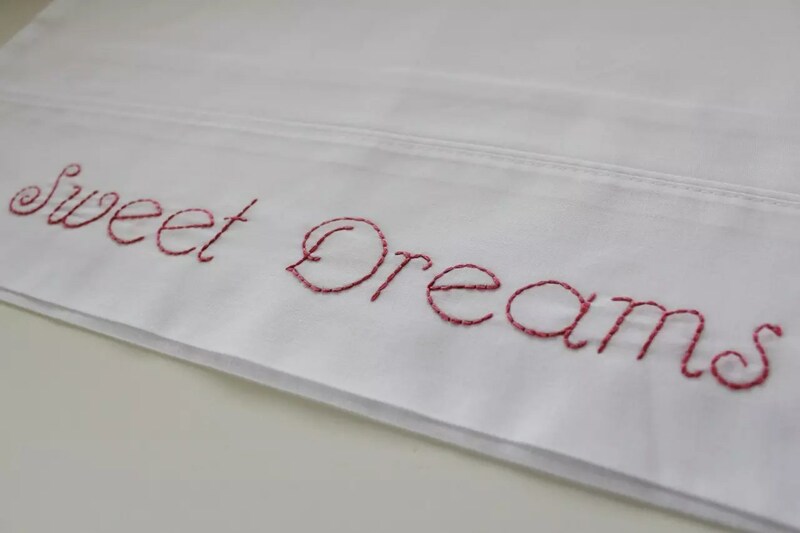 Hand embroidery is a gorgeous way to brighten up a store-bought pillowcase. I’ll show you how easy it is to use an iron-on transfer pen to transfer your design to fabric. Then it’s just a matter of embroidering your design. So simple and so pretty! It makes a terrific thrifty gift too! For more bedroom ideas visit the Little Girl’s Bedroom Makeover series. Choose your design to transfer to the pillowcase. You could use an image or picture but I wanted to write some text. So I popped onto the computer and created a Word document. 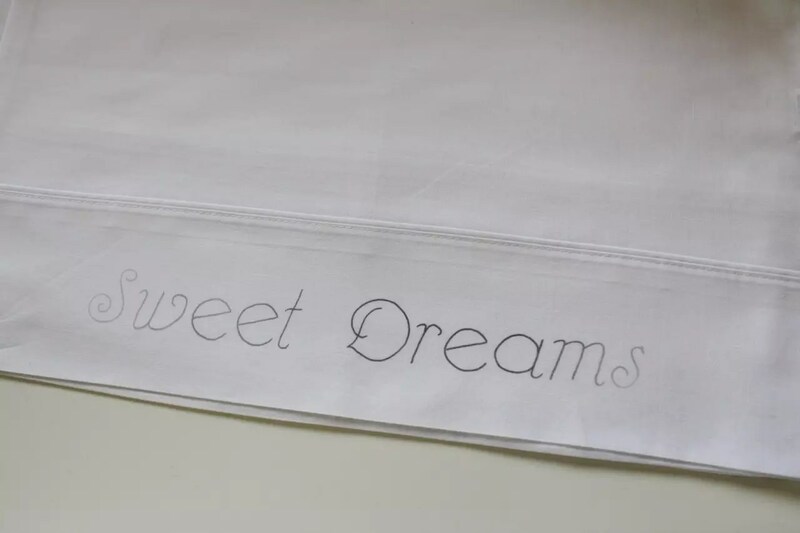 I typed the words ‘Sweet Dreams’ and played around with the font style and size until I found something I liked, that I could also easily embroider. I choose ‘Rhumba Script’ in size 110. It’s a free font you can pick up at DaFont.com. When you’re happy with your font and its size (or your image or design), print it out. Remember that whatever design you choose, it will be reversed during the transfer process. So if you’re working with text, it must be printed backwards. Your printer will have a setting for this. My Canon printer says ‘flip horizontally’. Grab your print out, a piece of plain printer paper and your Sulky iron-on transfer pen. Set yourself up on a flat surface. Follow the instructions that come with the pen to get the ink following. 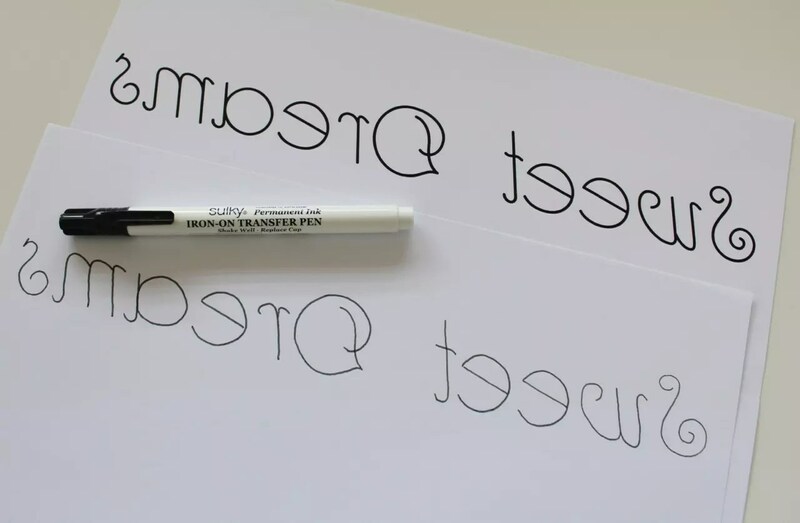 Then trace your text onto the plain paper by using the print out as a template underneath it. If you’re having trouble seeing the text through your paper, hold it up against a well lit door or window. (This is a great tip for those of us who are yet to own a light box!). Iron your pillowcase so it’s ready for transfer, and place it with the cuff across the ironing board. Ensure the iron is on a warm, no-steam setting. Place your traced design face down onto the cuff of your pillowcase. I’m super fussy, so I spent a bit of time measuring to make sure it was centred and straight. 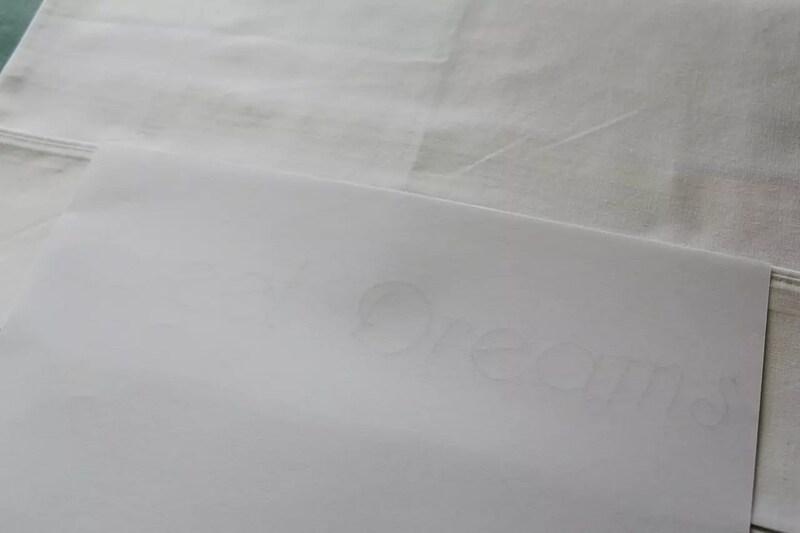 Follow the transfer instructions that come with your pen to iron your text to the pillowcase. You can see on my transfer that the heat wasn’t even during the ironing process as the ends are lighter. But it does the job. So now you’re all ready to get stitching! I love the look of simple back stitch. And it’s so easy to do! As I stitched this text, I kept my sewing hidden (between the two layers of cuff fabric), so that you can’t see the knots and stitching on the back of the pillowcase cuff. It’s not necessary to do this, but I love the clean finish it gives. Split the six stranded embroidery floss in half (I used DMC 335), and thread the three strands onto your embroidery needle. Be sure to create a simple knot at the end and trim the excess thread. 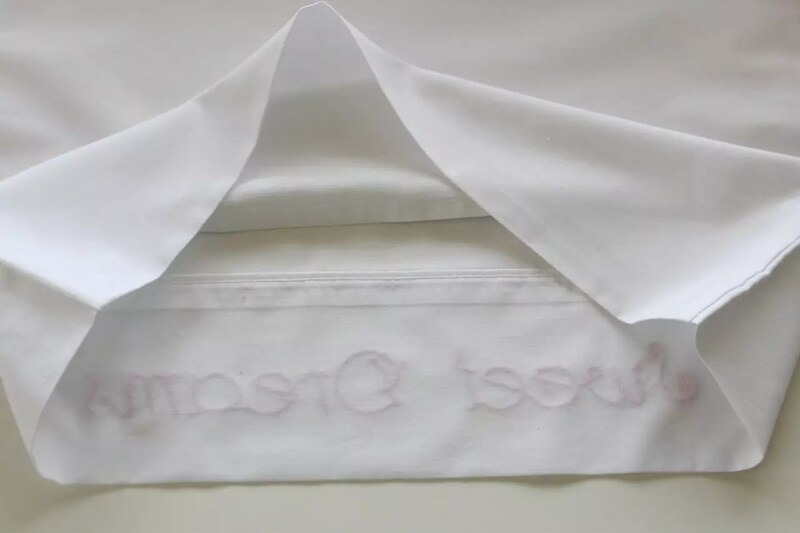 Bring the needle and thread up through the back of the pillow case cuff so that the needle pops up at the beginning of the first letter. As you pull the thread, separate the front and the back cuff fabric pieces. Give your thread a gentle tug so that the knot ‘pops’ through the back of the cuff and lodges itself behind the front piece of the cuff. That way your knot isn’t visible from the back. You’re ready to start backstitching. When backstitching, start by making a normal straight stitch. You’ve already brought your needle up to the start of your first letter. Make your stitch a few millimetres long. Press your needle down into the first piece of fabric, being careful not to catch the back piece of fabric. Then bring your needle and thread up a ‘stitch space’ ahead of your last stitch. Lastly, bring the needle down through the same hole as the end of the last stitch you made. As you do this, use your hands to help guide your needle between the two layers of fabric that make up the pillowcase cuff. 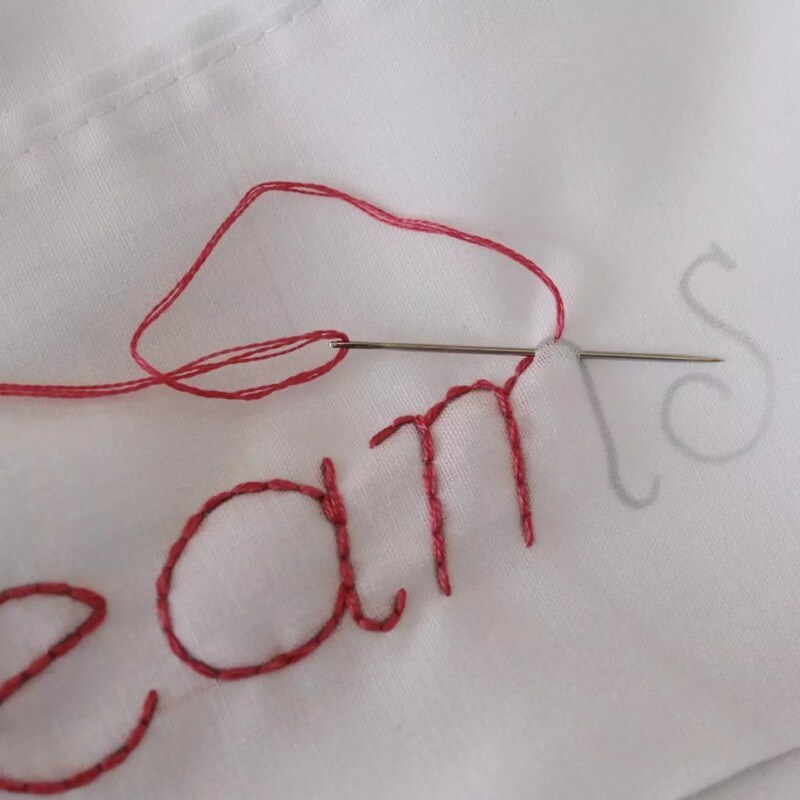 Continue backstitching your lettering, being careful to cover your transfer as you go. Try and keep your stitches the same length. However, make adjustments as you stitch so that you don’t end up with one unusually short or long stitch at the beginning or end of a letter. Guide the needle to the start of each new letter as necessary. 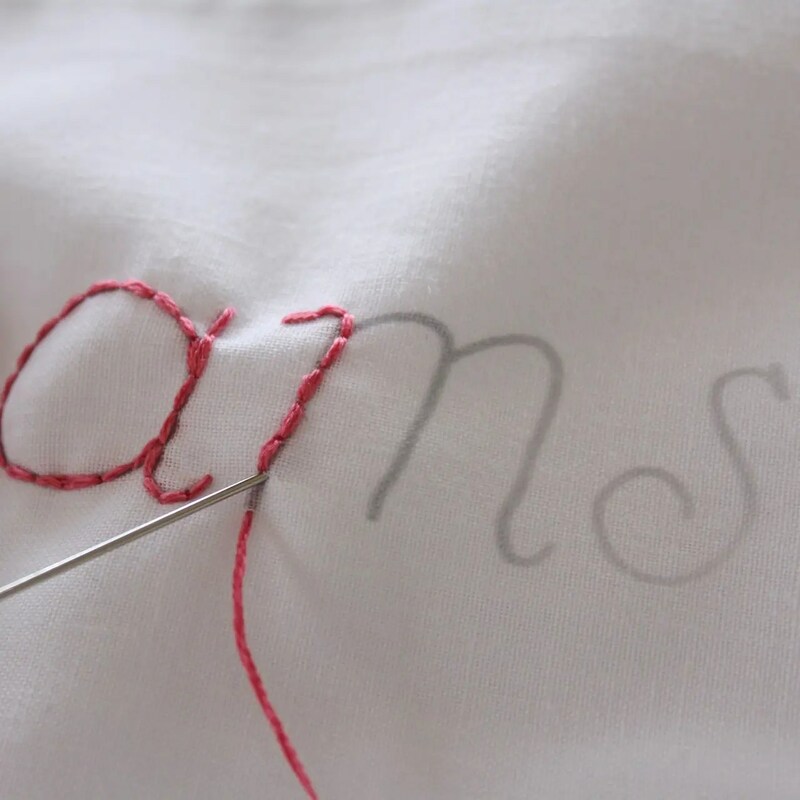 Consider the direction of stitching before you begin each letter, so you know exactly where you need to begin and end. As you finish your thread, feed the needle down into the cuff and be careful to catch a number of your hidden stitches to help secure the thread. Bring the needle out through the back of the cuff and trim the excess thread away. Give the layers of the cuff a bit of a rub so that the cut thread disappears inside the fabric layers. To start a new thread, follow the previous instructions to hide your knot and continue stitching. You could almost get away with telling someone you made the pillowcase yourself! Give the finished pillowcase a quick press and you’re all ready for use! 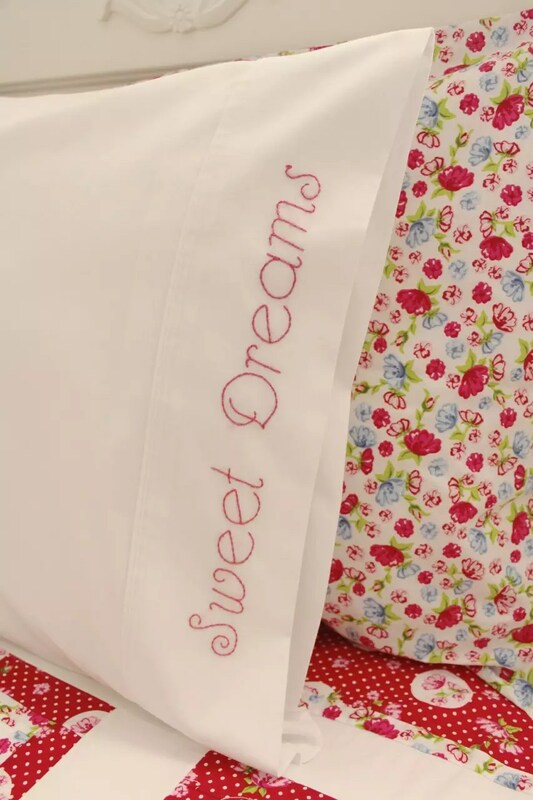 – Use light embroidery floss colours if you’re using a white or light coloured pillowcase. Darker thread colours will be more likely to show through from the back. 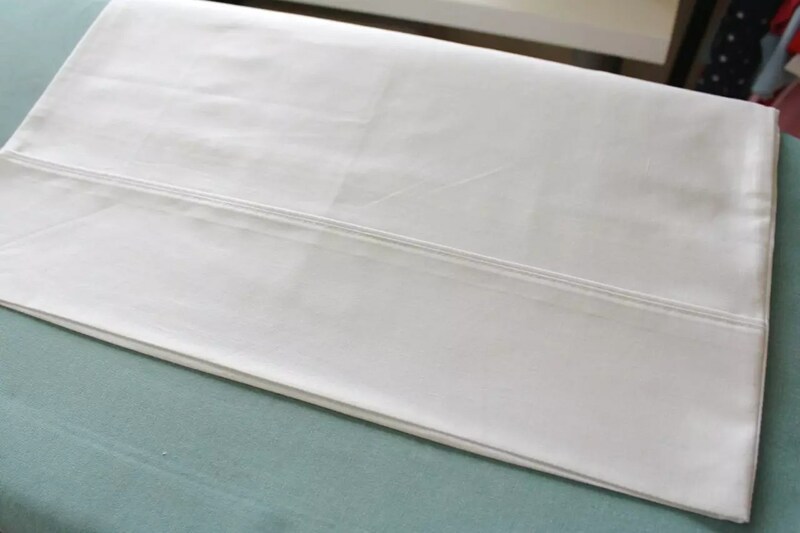 – For an everyday pillowcase that will be regularly laundered, be sure to really securely fasten your stitching. You’d hate to see your hard work come undone in the wash! You can use the transfer technique and the backstitch instructions on any suitable project. 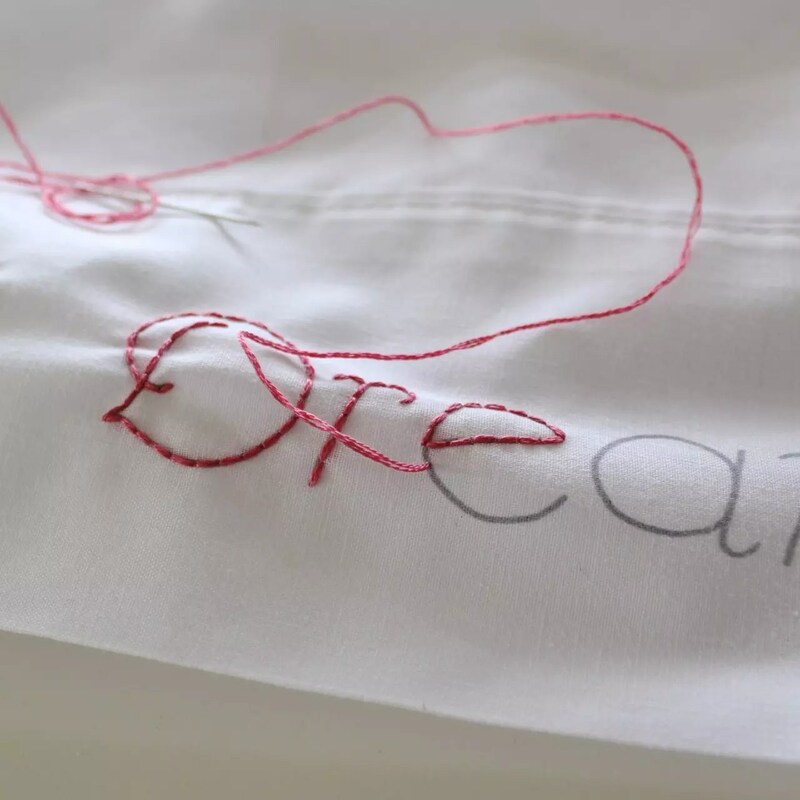 If you’d like to have a go at making your own pillowcase, you can embroider your text or image before you start sewing. I put together a very simple ‘beginners’ pillowcase tutorial if you’re looking for instructions. If you’d like to see more inspiration, you can take a peek at my Girls Bedroom Ideas board on Pinterest. I really love seeing your creations, so please feel free to share your work on the Molly and Mama Facebook Page too. Looks good.. But I’m too bad with needle and threads.. Anyways.. Where do you buy your blank pillow case? Any idea where I can get bulk supply online? Need good quality.